Microgreens are all the rage in the culinary world! More and more chefs are growing these delicate little plants, and they are getting more popular in the urban gardening scene. Not only do the microgreens taste delicious, they also look really pretty and are full of valuable nutrients. 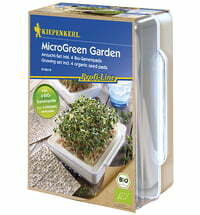 Microgreens are seedlings or plantlets that are a few days old. Since they are small and usually green, they are called microgreens. These young plantlets are much richer in proteins, trace elements and vitamins than their larger versions of sprouts. For this reason, they are also considered superfoods. Unlike sprouts, microgreens grow a bit longer and develop juicy green leaves before they are harvested. Microgreens are eaten without their roots. Enjoy your own green garden even in the smallest of spaces - and in every season. 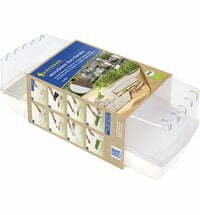 Choose from a variety of different vegetables to grow as multigreens. Fast growing varieties like broccoli, rocket, buckwheat, red cabbage, radishes, chervil and lettuce are generally recommended. Beetroot is also very popular. The seeds are soaked overnight and then sown densely in a dish. When growing the seedlings, you should pay particular attention to the right amount of water. It is best to water the seeds with a spray bottle because too much moisture or too cool of a location, quickly leads to mold growth. Conveniently, you can even sow several varieties together! Just try to make sure that the seeds germinate at the same time. Try different mixes until you have found the perfect one for you! Microgreens have a high nutrient content as well as an intense taste. They often offer up a spicy flavour! Add extra pep to your meals with these little greens. Harvest the seedlings just before eating, as they are very sensitive. Enjoy them as a tasty garnish of salads, sandwiches, stews or soups. Thanks to their pretty shapes and their strong colours, they add a splash of colour to any plate.